But this set-point, to a certain extent, can be reset. Although our general mood levels and well-being are partially determined by factors like genetics and upbringing, roughly 40 percent of our happiness is within our control, according to some experts, and a large body of research in the field of positive psychology has shown that happiness is a choice that anyone can make. As psychologist William James put it, “The greatest discovery of any generation is that a human can alter his life by altering his attitude." 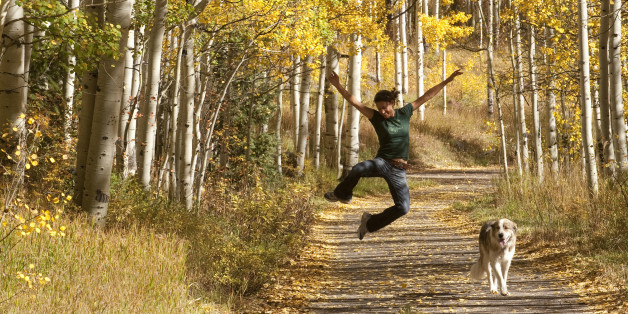 Here are eight ways you can take control of your own happiness. A little effort can go a long way in increasing happiness. Two small experimental studies, published this year in the Journal of Positive Psychology, found that simply trying to be happier could actually elevate mood and well-being. In one study, two groups of students listened to "happy" music -- one group was instructed to make a concerted effort to feel happier, while the other group was instructed not to actively try to lift their mood. The group that tried to feel happy experienced the most elevated moods after listening to the music. "Choose to take advantage of opportunities to learn how to be happy," Stevens told WebMD. "For example, reprogram your beliefs and values. Learn good self-management skills, good interpersonal skills, and good career-related skills. Choose to be in environments and around people that increase your probability of happiness. The persons who become the happiest and grow the most are those who also make truth and their own personal growth primary values." According to Rick Hanson, neuropsychologist and author of Hardwiring Happiness, our brains are wired to scout for all that's bad -- as he puts it, the brain is like velcro for negative experiences and teflon for positive ones. This "negativity bias" causes the brain to react intensely to bad news, compared to how it responds to good news. But we can counter the brain's negativity bias -- which triggers us to form stronger bad memories than good ones -- by appreciating and lingering on those tiny, positive moments. "People don't recognize the hidden power of everyday experiences," Hanson told The Huffington Post. "We're surrounded by opportunities -- 10 seconds here or 20 seconds there -- to just register useful experiences and learn from them. People don't do that when they could." The secret to happiness could be as simple (and difficult) as becoming more mindful. Meditation -- a practice that anyone can do, anywhere, so long as they're willing to sit and try to silence the mind -- is thought to be a happiness-booster. University of Wisconsin psychology professor Richard Davidson found in his research that a meditation practice might help to shift brain activity from the right frontal area of the brain (associated with depression, anxiety and worry) to the left, which has been found to correlate with feelings of happiness, excitement, joy and alertness. The secret to boosting your mood could be as simple as making yourself smile. A 2011 Michigan State University study found that workers who smiled as a result of cultivating positive thoughts exhibited improved mood and less withdrawal. Fake smiling, on the other hand, resulted in worse moods and withdrawal from work. Cultivating thankfulness and gratitude is a scientifically-backed way to increase happiness, and it's firmly within your control to choose to be more grateful. Grateful people tend to appreciate simple pleasures, defined as "those pleasures in life that are available to most people," according to a report in the journal of Social Behavior and Personality. Pursue happiness, find happiness -- and success. Conventional thinking has it that pursuing success will lead to happiness, but research has shown that it may be just the opposite. Pursuing happiness leads not only to happiness itself, but also to success, according to Shawn Achor, author of The Happiness Advantage. In his 12 years researching happiness at Harvard, Achor found that cultivating a positive mindset could boost well-being and improve workers' performance on many levels, from productivity to creativity and engagement. "People who cultivate a positive mind-set perform better in the face of challenge," he wrote in Harvard Business Review in 2012. "I call this the 'happiness advantage' -- every business outcome shows improvement when the brain is positive." Bronnie Ware, a palliative care nurse who spent years working with elderly people on their deathbeds, noticed a common theme that came up repeatedly among her patients at the end of their lives: They regretted not "letting" themselves be happy. Many did not realize until the end that happiness is a choice. They had stayed stuck in old patterns and habits. The so-called 'comfort' of familiarity overflowed into their emotions, as well as their physical lives. Fear of change had them pretending to others, and to their selves, that they were content. When deep within, they longed to laugh properly and have silliness in their life again ... Life is a choice. It is YOUR life. Choose consciously, choose wisely, choose honestly. Choose happiness. Want to increase your brain's capacity for happiness? Try meditating on compassion. Brain-scanning studies on French monk Matthieu Ricard found that when he was practicing loving-kindness meditation, his brain produced gamma waves "never reported before in the neuroscience literature." Ricard has the largest capacity for happiness ever recorded, thanks to neuroplasticity.